Crathes Castle (pronounced /ˈkræθɪs/ KRATH-iss) is a 16th-century castle near Banchory in the Aberdeenshire region of Scotland. This harled castle was built by the Burnetts of Leys and was held in that family for almost 400 years. The castle and grounds are owned and managed by the National Trust for Scotland and are open to the public. Crathes sits on land given as a gift to the Burnett of Leys family by King Robert the Bruce in 1323. In the 14th and 15th century the Burnett of Leys built a fortress of timbers on an island they made in the middle of a nearby bog. This method of fortification, known as a crannog, was common in the Late Middle Ages. Construction of the current tower house of Crathes Castle was begun in 1553 but delayed several times during its construction due to political problems during the reign of Mary, Queen of Scots. It was completed in 1596 by Alexander Burnett of Leys, and an additional wing added in the 18th century. 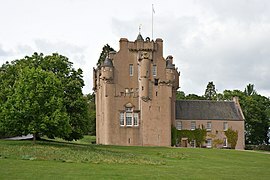 Alexander Burnett, who completed the construction of Crathes, began a new project, the early 17th-century reconstruction of nearby Muchalls Castle. That endeavour was completed by his son, Sir Thomas Burnett. Crathes Castle served as the ancestral seat of the Burnetts of Leys until given to the National Trust for Scotland by the 13th Baronet of Leys, Sir James Burnett in 1951. A fire damaged portions of the castle (in particular the Queen Anne wing) in 1966. Another historically important structure in this region linked to the Burnett of Leys family is Monboddo House. The castle contains a significant collection of portraits, and intriguing original Scottish renaissance painted ceilings survive in several Jacobean rooms: the Chamber of the Muses, the Chamber of Nine Worthies and the Green Lady's Room. The castle estate contains 530 acres (2.1 km2) of woodlands and fields, including nearly 4 acres (1.6 ha) of walled garden. Within the walled garden are gravel paths with surrounding specimen plants mostly in herbaceous borders. Many of the plants are labelled with taxonomic descriptions. There is also a grass croquet court at a higher terraced level within the walled garden. Ancient topiary hedges of Irish yew dating from 1702 separate the gardens into eight themed areas. Crathes and its grounds are open to tourists throughout the year. A visitors centre provides information about the castle and its surroundings. There is a tea shop on site and a car park for any size of car. During 2004 excavations uncovered a series of pits believed to date from about 10,000 years ago. The find was only analysed in 2013 and is believed to be the world's oldest known lunar calendar. It is believed that it was used from 8000 BC to about 4000 BC. It is believed to pre-date by up to five thousand years  previously known time-measuring monuments in Mesopotamia. The site in Warren Field was discovered from the air when unusual crop marks were seen by the Royal Commission on the Ancient and Historical Monuments of Scotland. ^ Palmer, Eddie (March 2007). Scottish Canoe Classics: Twenty Five Great Canoe and Kayak Trips. Pesda Press. p. 46. ISBN 978-0-9547061-9-7. ^ Gomme, Andor; Maguire, Alison (2008). Design and Plan in the Country House: From Castle Donjons to Palladian Boxes. Yale University Press. p. 31. ISBN 0-300-12645-X. ^ Black, Jonathan (15 July 2011). The Face of Courage: Eric Kennington, Portraiture and the Second World War. Philip Wilson Publishers. p. 144. ISBN 978-0-85667-705-2. ^ Scottish Renaissance interiors. Moubray House Press in association with the National Trust for Scotland and the Historic Houses Association for Scotland. 1987. p. 19. ^ "Crathes Castle". Britainirelandcastles.com. Retrieved 14 April 2014. ^ Goulty, Sheena MacKellar (2 September 2003). Heritage Gardens: Care, Conservation, Management. Routledge. p. 23. ISBN 978-1-134-90478-5. ^ a b "'WORLD'S OLDEST CALENDAR' DISCOVERED IN SCOTTISH FIELD". Yahoo7. 15 July 2013. Retrieved 15 July 2013. ^ a b "'World's oldest calendar' discovered in Scottish field". BBC. 15 July 2013. Retrieved 15 July 2013. Wikimedia Commons has media related to Crathes Castle.